Tiwa Savage urges women to be exceptional in their work and commitments. The singer also submits their is no basis for comparison between men and women if each gender will play its specific roles. Nigeria’s pop queen, Tiwa Savage, has made a submission in which she stated she does not think men and women are the same or equal. She made her submission during a chat with Beat FM’s Toolz on the station’s “The Midday Show”. 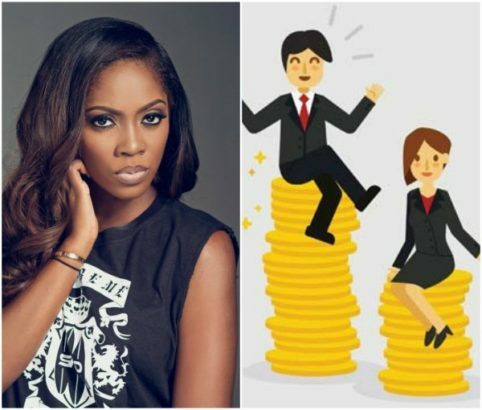 Tiwa encouraged all women to be good at what they do without necessarily comparing themselves with anybody even if it means putting in extra efforts. “Once you get there, you don’t complain about how you get there. So, whatever it is you have to do as a female, you just have to get it done,” she said. “So I think as females when we realize that yeah we can be strong in our career, but when we are home we have to realize that the man is the head of the house”.